War for the Planet of the Apes movie review: stirring finale evokes Kurosawa | Daily Review: Film, stage and music reviews, interviews and more. With whom do we empathise in the Planet of the Apes movies: ape, or human? Full marks if your answer factors in a case-by-case approach, taking into account the many dramatic complexities conjured by the franchise’s rather outré screenplays, which have a habit of painting bizarre visions that seem perfectly normal in context – like apes speaking in sign language while riding horses. But when it comes to the original five films (pumped out in almost as many years, starting in 1968) the most ape-related empathy I ever felt was for the poor bastards sweating it out in those cheap monkey suits. For any actor dreaming of stardom in Hollywood, this was surely tough to stomach: one ladder up, or one snake away from, donning the Mickey suit and hugging children at Disney World. This is a film that makes you feel. The latest installment, War for the Planet of the Apes, continues a tradition that has greeted the release of all new-millennium Apes movies, kicking off with 2011’s Rise of the Planet of the Apes. As each interspecies adventure arrives in cinemas, so does a fresh spate of think pieces from slack-jawed writers, posing the question of whether the motion capture-assisted actor Andy Serkis (who plays Caesar) will ever get just recognition for his unquestionably affecting performances. Huh? Not only does Serkis get recognition; he gets semi-regular, rhapsodic plaudits in all the major rags, trumpeting him as the greatest digitally-enabled performer of all time. Despite, or perhaps because of, a face that looks like it’s been hit by some kind of science fiction skin disease. Sure, Serkis hasn’t got that Oscar yet, surprising as this may be for a person making a living by impersonating an ape. Alfred Hitchcock didn’t get one either (excluding the Academy’s belated, glorified coach’s award) so he is in good company. In War, director Matt Reeves, following up his excellent Dawn of the Planet of the Apes, concludes what is purportedly a trilogy (but if history has taught us anything, it’s that Apes’ movies keep on coming) with a small number of set pieces intensely scrutinised for maximum effect. The mist, trees, moss-covered rocks, rustic wooden edifices and large, protruding human constructions reminded me of the Akira Kurosawa films Throne of Blood and The Hidden Fortress. In War for the Planet of the Apes, the theme is revenge. It is the greatest compliment to Reeves, Serkis et al that a comparison to the Japanese master does not constitute heresy. Rise/Dawn/War (particularly the last two) are very fine, very thoughtfully constructed films. They have a certain aching quality about them, derived from a melancholic view of the world that vastly eclipses their capacity for wonder – certainly from an aesthetic, Hollywood point of view. The place is ran by a smooth-scalped, Kurtz-inspired rogue colonel, played with perfect, leery military grunt by Woody Harrelson. He has one of the franchise’s best monologues, unloading a brutal but somehow poignant rumination on the nature of war, on a simian flu that rids humans the power of speech, and what he views – and we know – as the inevitability of an ape-ruled Earth. It’s a great scene. Caesar is assisted by the eminently huggable orangutan Maurice (Karin Konoval) and a ragtag bunch, including the ironically named Bad Ape (Steve Zahn) who has developed the ability to speak, and is used for comic relief. In the original Planet of the Apes movies, the most memorable scenes revolved around humans – including Charlton Heston’s famous “you maniacs!” moment on the beach in the first film, and subterranean telepathic weirdos worshiping a nuclear bomb in the second. I can’t say I felt much empathy for the actors playing apes in the new movies; we’ve covered off on my thoughts about the great (and well recognised) Andy Serkis. But the apes themselves, as in, the characters: I certainly felt for them. This is a film that makes you feel. Whizbang special effects are deployed in various memorable ways, but none more so than the etching out of simian faces. You can get lost staring into them. This was such a wonderful movie ! Emotional and pleasant to the eye. 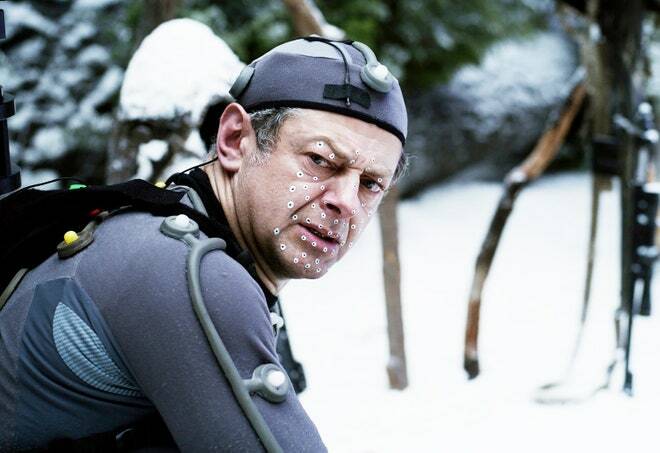 I’m impressed by Andy Serkis. He gave such an intense performance and gave us this great great Caeser ape character. Bravo for this powerful trilogy ! …as Peter Dutton’s masked and weapon-toting Border Security terrorists! As the fantastic final scene rushed toward us – lounging back in our slide-forward Hoyts seating – my wife commented in an aside on the white-uniformed, white-trucked army surging into the scene – Oh, the goodies arrive! (She recognises the standard racism of US movies!) But were they? And then the great white baptism. I got the Kurtz reference – but his military thugs I saw as Peter DUTTON’s terrorists! I swear to god!